Natural ventilation consists of using natural forces to drive airflow though a space. As me mentioned earlier, its three goals are to ensure to improve indoor air quality and reduce energy consumption while maximizing the thermal comfort for the occupants using the space. 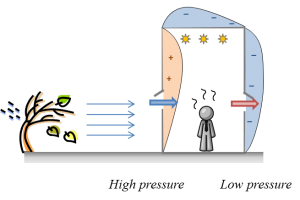 Two natural forces can be used to drive air through a building: wind and buoyancy, which lead, respectively, to two main natural ventilation strategies: cross ventilation and stack ventilation. When wind hits the windward facade, it creates a positive pressure on the facade. Similarly, as it flows away from the leeward facade, a region of lower pressure will be created. If windows are open in the building on both the windward and leeward side, air will be forced through the building, because of the pressure difference between the openings. 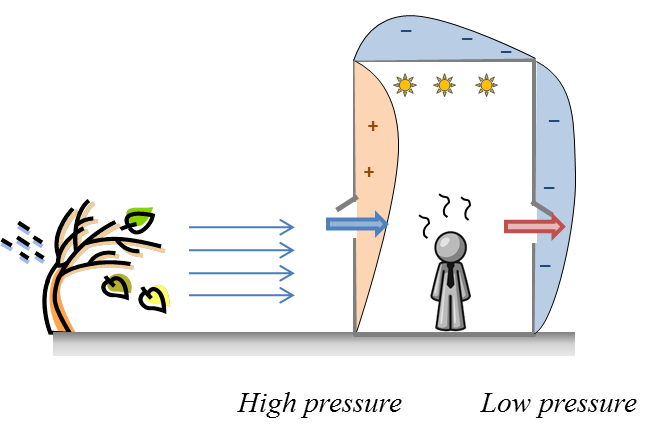 How “positive” or “negative” is the pressure at each opening is measured by a number called the wind pressure coefficient ( ). A positive indicates that the wind is impinging upon the facade, applying a positive static pressure on it. Conversely, if the is negative, it indicates that the opening is exposed to suction due to flow separation from the building. The value of varies depending on the vertical and horizontal location of an opening on a facade, as well as on the wind incidence angle and the building’s aspect ratio. For basic calculations, you can begin by assuming an average value for each facade. For a rectangular building (without surroundings) these values can be obtained graphically from tables or contour plots based on existing experimental results (a good reference is the ASHRAE Handbook of Fundamentals). For other building shapes, and building with obstruction surrounding them, you may need to run an external CFD analysis (or wind tunnel study) to get the exact numbers. where and are the wind pressure coefficients for the inlet and outlet, is the density of air at ambient temperature, and is the upstream wind velocity. For more details on the calculations, please refer to the CoolVent user manual **LINK**. How well cross ventilation works is dependent on many factors including: building location with respect to pre-dominant wind directions, interior layout of offices, corridors, furniture, and other potential airflow obstructions, sizing of windows and other openings. Stack or buoyancy-driven ventilation relies on the temperature difference between the air inside the building and the outdoors to drive the flow. Warmer air is lighter (think of smoke rising up) than colder air, which is heavier. 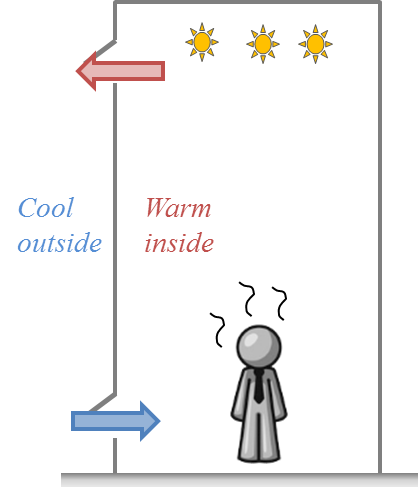 When there is a building full of warm air and it is exposed to an environment with cooler air, and two vertically spaced windows are opened, the lighter air will escape through the to opening and the colder air will enter the building through the lower window. The airflow through a space is proportional to the temperature difference, the effective area of the openings and obstructions, and the total buoyant pressure difference driving the flow. Building orientation (controlling for solar heat gains) has no effect on the resulting airflow through the building. where and are the indoor and outdoor air temperatures, respectively is the vertical distance between the top and lower opening. 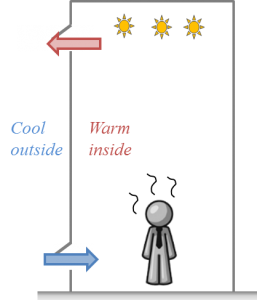 If several vertically-spaced windows were open in a building, the cold air would still be entering through the lower windows and the hot air leaving through the upper windows. The height at which this transition happens is called the neutral plane, its location is dependent on both the size and location of the air obstructions (windows, ducts, etc), and it is critical to design a building that ensures that the neutral plane will not be too low to cause back flow in certain building zones. You may use CoolVent to do this. where and are the area and discharge coefficients of each of the openings (internal and external) that which the air goes through. The discharge coefficient, which ranges from 0 to 1, is a measure of the amount of pressure that the air loses as it goes through every opening of flow resistance. For reference, the discharge coefficient for windows is of the order of 0.65. Thermal mass can be incorporated into a building structure to absorb heat during the daytime hours and release it at night. The leads to a dampening of the internal air temperature variation, and a lag of the peaks. Typically this mass is incorporated into ceilings and walls in the form of concrete or brick. The use of thermal mass is particularly relevant in regions of the world where the ambient temperature is very high during the day –to high to bring outside air into the building– but low enough during night time. Night cooling is a strategy that consists of closing the building’s windows during the day (not completely — always allowing the airflow necessary for minimum indoor air quality requirements) and opening them during the night. The implementation of night cooling rests on many considerations. For example, exposing a building to the outside at night can be a security risk. Also, if a building is cooled down too much at night, workers may be uncomfortable the following morning. In that case, heaters may be turned on, needlessly using energy.